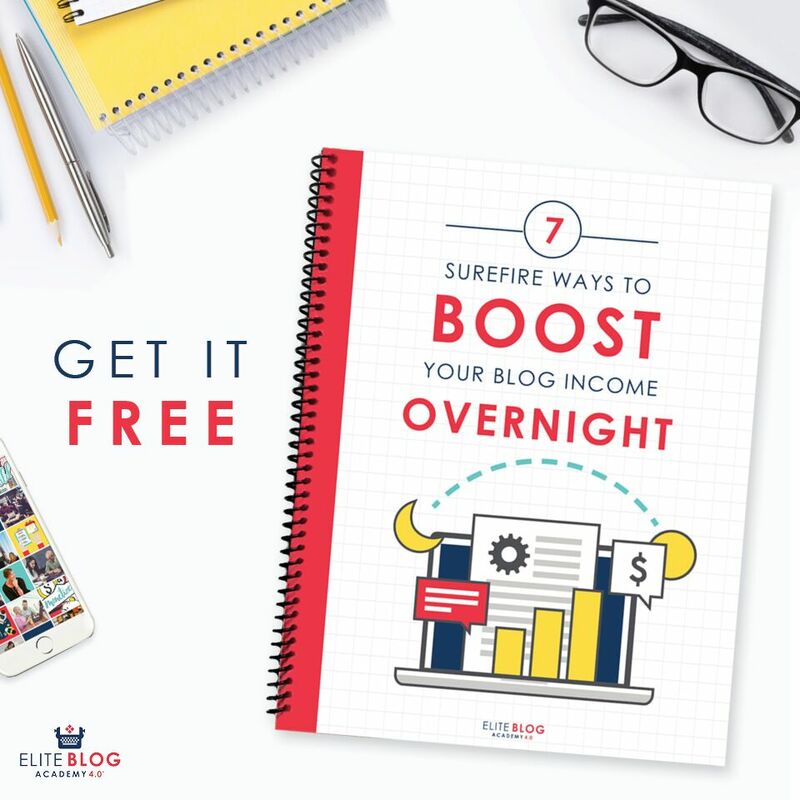 Blogging is a legitimate way to earn money and one of the ways I do so. And, it’s something anyone can do as long they’re committed. Here is update number one on my blogging goals. If you’re new here let me get you up to speed. I like to challenge myself so I made a goal last month to reach 100,000 page views in one month. I’ve given myself six months to do this. I figure since blogging is a way to earn some decent money and there are a lot of other bloggers who read, I’d share my progress. Hopefully it can help someone else, too. I originally declared that I would guest post, work on social media, and work on SEO to get more traffic. The good news? I have several guest posts coming up in the next two months. The bad news? None of them have been published quite yet. So I can’t tell you what the effect of those will be at this point. However I can tell you that my daily search traffic has tripled since I made this goal and optimized my posts. So, how’d I triple my search engine traffic in a matter of weeks? Let me tell you! Before I tell you everything I’ve done I want to show you some proof. Here is a snapshot of my Google Search Traffic. You can see that at the beginning of the month I was getting around 80 -120 hits per day. So, on average Big G sent about 100 different people my way per day. Not amazing, I know, but this is still proof that the changes I made helped! Now take a look at the end of the month. Do you see that insane rise? That happened a week or so after I went through my post popular posts and optimized them. I then started following all of Jeff’s tips for all of my new posts. So does SEO work? Yes! Who would’ve thought! Everything I’ve done is in Jeff’s video. So, I still recommend you watch it because I’m probably forgetting some crucial detail. **I want to state that I don’t write anything at all with the search engines in mind. I write what I want to write about – period. And, this could be one reason why my traffic is increasing. I simply write what I think will be useful and THEN go back and optimize it. Make sure your title contains a keyword. Bold your main idea in your introduction. Make sure there are keywords in the bolded main idea. Restate (in different words) the idea of the post in your headings. Use your SEO form! I never, ever did this and now I do. 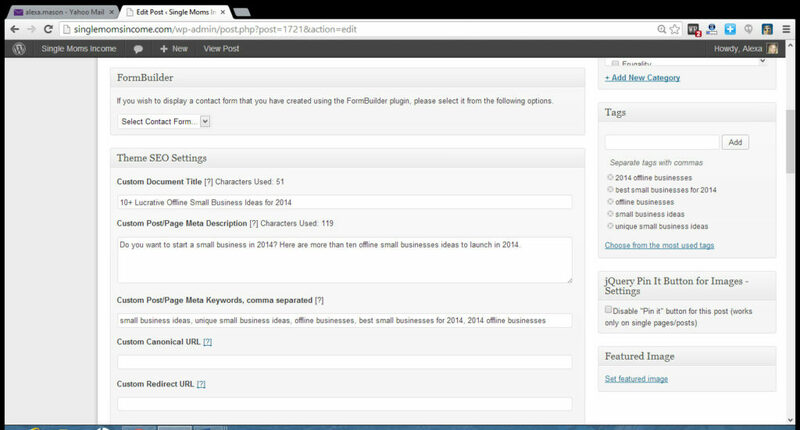 Fill in the title, description, and keyword portion of your SEO form. I use a Genesis theme which has built in SEO. 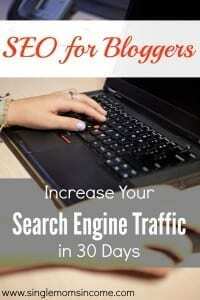 You can download an SEO plugin, like Yoast SEO, if your blog doesn’t already have one. Edit the hyperlink (only on new posts, you don’t want to lose all the links you have on past posts) to contain the keyword for the main idea of your post. Use descriptions and alt tags in your pictures. Here’s a little better explanation in pictures. 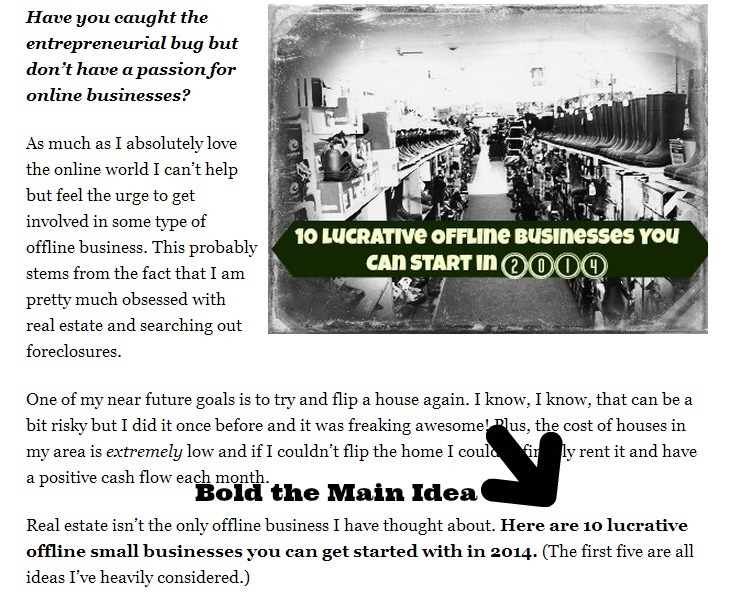 I am going to use the post I just wrote about small business ideas for 2014 as an example. This post seems to be getting quite a bit of traffic already. I came up with the idea when thinking about all of the offline businesses that I’ve wanted to start. I’ve read several posts where people state that their longer articles are what makes it in the search engines. This blog post is around 1500 words. Next I edited the hyperlink to the following https://singlemomsincome.com/offline-small-business-ideas-2014/ Now it has just the keywords I want in it. I then created a picture to go with the post. 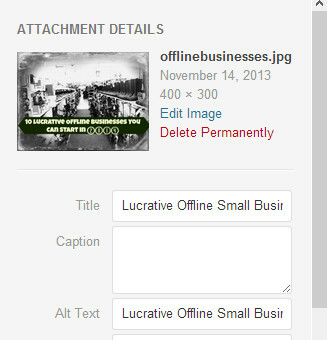 When I uploaded the picture I titled it Lucrative Offline Small Businesses I used the same description for the Alt text. Lastly, I filled in my SEO form. I’m going to admit I used to think I would get banned by Big G for doing this. For some reason it just felt like I would be gaming the search engines – apparently not. Now when I fill in the title for the description I try to think of something I would click if it came up in a search engine and I also include the keywords of the post. On to the description. You only have around 160 characters to fill this out. What I do is state the main idea and try to use two variations of the keyword. The description and title that you fill out in your SEO form is what shows up in the search engine results. See below how I filled in my SEO form. I then fill in the meta tags with varying keywords that describe the post. I copy and paste those keywords to my tags on the left. So, that’s how I did all that. BUT I found one more shocking revelation. You’ve probably noticed people’s pictures showing up beside search results in Google. That is Google Authorship. Here is a post explaining how this is set up. I’ve been reading a lot on the importance of using Google Authorship on posts you write. In case you didn’t know Google Authorship is supposedly going to play a huge role in search in the future. Allegedly, trusted authors will dominate the search engine. Over the past couple months I have been linking to my “hire me” page in my author boxes from this website and also from Defeat Out Debt. I use the anchor text “personal finance freelance writer”. Before adding Google Authorship to my hire me page I ranked on page number 4 in Google when searching for that term. I wondered if adding authorship to my hire me page would affect my search engine ranking, so I added it. Two days later? I’m on page number two of Google for that same search term. Coincidence? I don’t think so. I am now adding Google Authorship to all of the guest posts I submit. I think this is going to play a huge role in the future of search. I used to think search engine optimization was sleazy and was all about gaming the computers. I don’t think that anymore. I think you should write want you want to write and then go back and help the search engines finds you. I mean, think about it. If you write a post but don’t really let the search engines know what the post is about how are they going to find you? They won’t. I’m still far from my 100k page views goal. But, almost a 30 percent increase in page views from some simple SEO stuff? I’ll take it! What are your thoughts on search engine optimizations? Have any tips to share? Congratulations on increasing your traffic by so much! Once again this just goes to show that if you play by the Google rules you will be blessed with natural, organic traffic. Thanks for the tips! I will keep them in mind with my future posts. Great insights, Alexa! I recently started using the SEO form and I’ve also seen some good results from utilizing it. For the longest time I left it blank, unsure of whether it would make a difference. I also need to look into Google Authorship – it’s on my list for 2014. Great post! I’ve always been intimidated by SEO or thought I’d get banned from Google for trying it. I think I just really overcomplicated the process. It’s really not too hard. Great job, Alexa! I definitely think there is a place for SEO and it doesn’t have to be sleazy or scammy! Thank you! I think you have some really informative articles on your site so the SEO stuff might be effective for you as well. I am too nervous to hire someone from Odesk to do the SEO stuff. They probably do know more than me I guess I would just want to know in detail what the person was doing. But it does work for others so maybe I’m just too paranoid. Thanks for the explanation on SEO…I keep hearing about it but didn’t have any clear ways to improve that on my blog. It’s definitely something I’ll have to keep in mind for the future. As for google authorship…I guess I can’t be an anonymous blogger if I want to take advantage of that…we’ll see. I think you can still be anonymous with Google Authorship….kind of lol. Just use your first name and maybe initial of last name and don’t use an actual picture of yourself on your profile. You’ll still be able to implement it that way. I can’t recommend enough you actually try the WordPress SEO by Yoast plugin. It is so much more powerful than the one that you show above, and its totally free. The best thing that it does is that it offers you a scorecard of the SEO settings on each of your own posts, and gives you step by step instructions for how to improve them. I used All-In-One SEO for over a year before trying it out, and the difference is night and day. Thanks so much for the tip. I’ll definitely give it a chance. A few of the blogs I write for use the Yoast plugin but I never really paid too much attention to it. I’m going to download it now and see what type of difference it makes. Thanks, Jefferson! Here’s one more strategy to help boos that post: upload a YouTube video targeting the same keywords and embed into your post. Be sure to link to the post in the YouTube description box. If you’re not comfortable or don’t have the equipment to film the video, head to Fiverr.com and you’ll find some awesome “whiteboard videos” that will look very professional. Thanks, Jeff! And, really appreciate you posting your SEO video. I actually just made my first video last week. Scary but fun. So I am going to continue to ease into the video blogging. I hope to add more to my posts in the near future. This is great stuff, one thing to keep in mind about searching for your own terms is personalization. You’ll see higher results than might be typical, you can alleviate that a little by searching in incognito/private browsing mode on your browser, make sure you’re logged out, or turn off personalized search. I didn’t think of that and that’s a good point. I’ll have to do that and retry my search, maybe my Google Authorship wasn’t as effective as I had thought it was. I am a total SEO dummy, so thank you for giving some simple instructions. 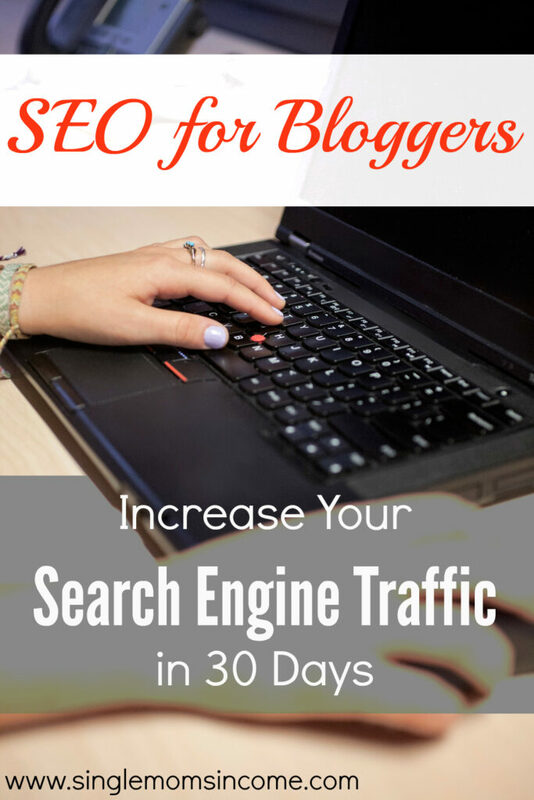 Do you happen to know if Blogger has an SEO form or whether a plug in would be needed? Nice work Alexa. SEO is powerful if you do it right. One thing I will comment on is there is no need to fill in the “keywords” section of the SEO form. Those are no longer looked at by the search engines. People spammed their keywords in there, so Google and Bing just disregards that tag. While you can still fill it out, it doesn’t affect your SEO. Very useful tips. I fill in my SEO form, but don’t really pay much attention to keywords, which I certainly need to do. That’s great on the rise in traffic. Great post! This was really helpful and informative – thanks for sharing your experiences and your findings! Thank you for sharing this helpful hint Alexa! Wow, thanks for writing such a detailed post. I’m really intrigued by Seo. One of my posts now routinely gets 800 views per day. I’d really like to figure out how to do it again. It was just a happy accident. Wow, this is incredible. I installed SEO Yoast and I didn’t even know what to do with it, lol. Now I will work on it more! As important as great content is, we need to take care of our SEO. We can’t avoid it as bloggers. I’m also a big fan of internal linking as often as possible. Alexa, this post is so timely for me! I am about to start learning about SEO and wasn’t sure where to begin. I’ve always felt a little intimidated by the process. Your explanation was clear and very easy to understand. Thanks for your help! This is so, so helpful – thank you! Fantastic! I didn’t know bolding keywords in the intro was SEO. And I agree on everything else—using the SEO form, labeling your images, keywords in titles. Speaking of keywords in titles, not only does it do good for SEO, but easy to understand keywords in a title make viewers click it more than if the title was ambiguous or was more like a journal title. Very helpful post, as always Alexa. You do a great job of breaking it down and showing how this has actually worked for you. I’m still such a beginner, but trying to learn. I do use the Yoast plugin, not sure if it is really helping, but I always fill it out. My problem is knowing which keywords to target, I’m not sure if I’m doing a good job with that. Thanks for all the tips Alexa. I read about SEO when I started the blog and I’m glad I did. It’s good to know I was doing a lot of those things already, but there is room for improvement! I have Yoast SEO already but really don’t think about keywords too much. I normally find myself finishing an article then wondering what keyword it should be optimised for… I really have no idea apart from maybe 3-4 of the ones I have written so far. I think the key thing for me to take away is to read back some of the popular posts like you have done, as once you have re-read the article after a time it probably is a lot more obvious what “the key point (a.k.a word)” is about. Is this your current strategy atm then? Hey thanks for posting this, does this still work at the moment? Does this method work on most websites then? Alexa, Thank you for your very informative blog. I am new to blogging and I am still learning. I knew I needed traffic and organic readers and was very new to this. I would love to grow my blog and provide positive and useful information.